Smiling with esthetic natural teeth is the most beautiful part of a person’s life. People commonly avoid smiling if their teeth are irregular, malformed or discoloured, by covering up their mouth with hands or manipulating lips thereby restricting their unaesthetic appearance. Young adults are more conscious about their unattractive teeth due to advances in the world of photography and current influence of social media on them. Overcoming the problems faced by youngsters by smile designing may produce a drastic change in their life. Beautification of one’s smile is a fine artistic piece of work a cosmetic dentist can deliver. Veneer is the most conservative alternative to full coverage restoration for enhancing esthetics of anterior teeth. Veneers have evolved over the last several decades to become one of esthetic dentistry’s most popular restoration [1,2]. Veneers are the most suitable option for a conservative aesthetic approach because they leave nearly all of the enamel intact before the veneer is placed . Earlier porcelain laminate veneers were considered as the treatment option for tooth discoloration, but currently the recent treatment strategies such as bleaching and enamel microabrasion are more commonly advocated . However, common esthetic problems faced by young adults such as enamel hypoplasia, spacing in between teeth mainly midline diastema and occurance of microdontic unusual shaped teeth such as Peg laterals are still being conservatively treated by Porcelain laminate veneers. A 21 year old female patient reported to the department of conservative dentistry and endodontics for esthetic improvement of her front teeth. Patient was unhappy with the large white spots on her teeth which restricted herself from smiling. A detailed report was taken regarding medical, past dental and family history. She had no relevant medical history. Her past dental history shows that deciduous teeth were unaffected and these white spots were present after eruption of permanent teeth. None of her family members had similar defects. Extra orally no abnormal findings were seen. Intraoral examination of teeth reveals generalized mild enamel hypoplasia and was severe in maxillary right central incisor and maxillary left lateral incisor (Figure 1). All the teeth were vital and no relevant history of hypersensitivity present. Full mouth prophylaxis was done due to mild gingival inflammation. Later various conservative treatment options such as composite and porcelain laminate veneers were discussed with the patient. As the patient wanted minimal loss of tooth structure for her treatment, we agreed upon porcelain laminate for her maxillary right central incisor and maxillary left lateral incisor. 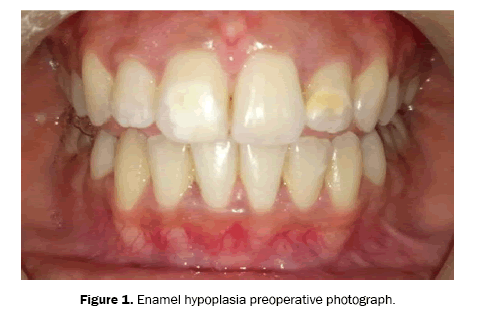 Figure 1: Enamel hypoplasia preoperative photograph. Preoperative photos and impression of both arches were taken for diagnostic cast. Preparation of tooth was done within enamel (0.5 mm). Initially depth orientation grooves were placed labially providing a depth of 0.3 mm in the gingival half and 0.5 mm at the incisal tip using depth cutter diamond bur. Tooth structure in between depth orientation grooves were removed using coarse round ended tapered diamond bur. A slight chamfer finish line was prepared at the level of gingival crest. Proximal reduction was extended into contact area but stopped just short of breaking the contact. An overlapped incisal edge preparation was chosen because incisal overlap provides a vertical stop that aids in the proper seating of the veneer and also for improving the bonding area of tooth surface. Lingually the finish line was prepared using a round end tapered diamond bur joining both proximal finish lines. The finish line proximally was kept 1 mm away from centric contacts and the sharp angles of the preparation were rounded (Figure 2). Figure 2: Veneer preparation photographs. A putty wash impression was made using vinyl polysiloxane after gingival retraction. The shade was selected with VITA 3D master shade guide under direct sunlight. Temporary restoration was given with Protemp Plus (3M ESPE). In the next appointment temporary veneers were removed, cleaning and isolation of the teeth were done. The porcelain veneers (IPS-emax) were then tried on to the teeth and checked for fit and esthetics. The inner side of porcelain veneer was silanised by the laboratory. Then etching of teeth were done with 37% phosphoric acid for 15-20 seconds, rinsed thoroughly with water and dried. Now on to teeth surface, a layer of bonding agent (Adper single bond 3M ESPE USA) was applied and cured for 20 seconds. And bonding of veneers to the teeth was done using dual cure resin cement (Calibra, Dentsply). The veneers were then positioned on to the teeth with gentle pressure and the excess cement was removed. Finally light curing was done for 10 seconds initially. Excess cement that remains after setting was removed with a NO: 12 Bard-Parker blade. Initially light curing was done from lingual side for 60 seconds so that the resin cement shrinks towards tooth thereby providing more retention. Then light curing was done on each segment of veneer for 40 seconds. Occlusion was checked using an articulating paper (Figure 3). 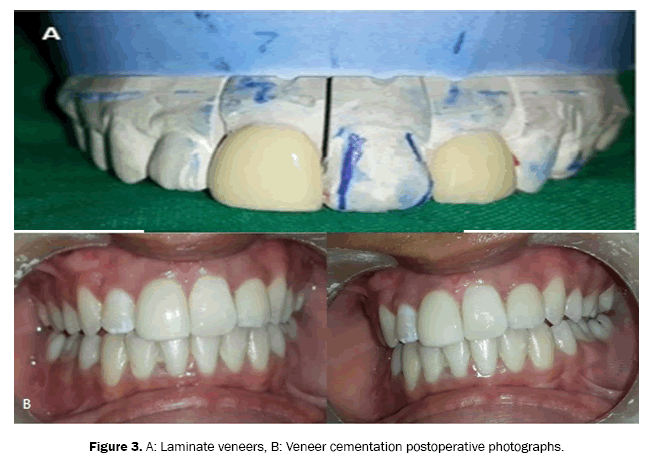 Figure 3: A: Laminate veneers, B: Veneer cementation postoperative photographs. A female patient aged 22 reported to the Department of Conservative Dentistry and Endodontics with a complaint of small front teeth on both sides of upper arch. A detailed case history taken shows no relevant medical, dental and family history. No abnormal extraoral findings found. Intraoral examination reveals bilateral peg shaped lateral incisors with midline diastema. Treatment option was to decide for a multidisciplinary approach. So the patient was send to Orthodontic treatment for opening the space mesial and distal to the peg-lateral thereby creating space for a normal sized lateral incisor. Patient returned back to the department in 6 months-time after completion of orthodontic treatment (Figure 4). Next stage of treatment plan was to check for the gingival status. On examination mild gingival inflammation was seen. So the patient was send to the department of periodontics for improving oral hygiene and to correct the gingival zenith for better esthetic results. Patient reported back after full mouth prophylaxis and laser gingivectomy (Figure 5). Now the plan was to give a good esthetic restoration. We discussed with the patient about various treatment options and patient agreed for porcelain laminate veneers. Figure 4: Peg laterals with midline diastema-preoperative photographs after orthodontic treatment. 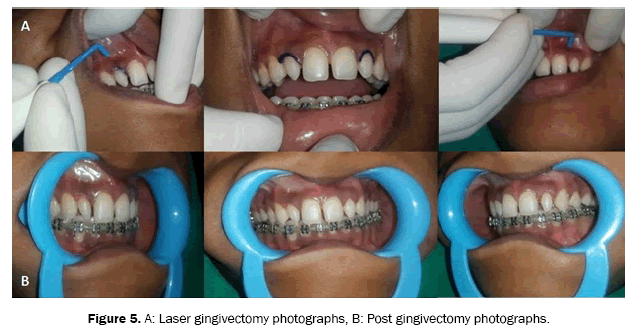 Figure 5: A: Laser gingivectomy photographs, B: Post gingivectomy photographs. Veneer Preparation and cementation was done considering the standard protocol. Minimal preparation was done for Peg laterals with equigingival margin (Figure 6). 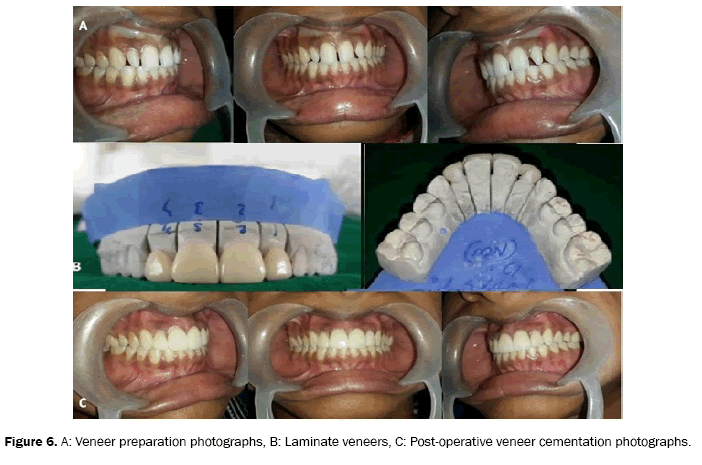 Figure 6: A: Veneer preparation photographs, B: Laminate veneers, C: Post-operative veneer cementation photographs. The etiological factors for enamel hypoplasia include: vitamin deficiencies (rickets), hypocalcemia, excessive fluoride ingestion, local infection or trauma or may be idiopathic. Treatment options are laminate veneers, vital tooth bleaching, composite veneering and microabrasion . The etiology of diastema may be attributed to the following factors: (a) Hereditary such as tooth and jaw size discrepancy, congenitally missing teeth, supernumerary teeth and abnormal frenum attachments; (b) Developmental problems such as habits, posterior bite collapse, periodontal disease, and tooth loss . Midline diastema should be treated depending upon the causes by multidisciplinary approach including surgical correction, orthodontic closure and restorative therapy . The restorative closure of diastema can be achieved by using any of the techniques mentioned; direct or indirect composite veneers, porcelain laminate veneers, all ceramic crowns, metal ceramic crowns and composite crowns [7,8]. Peg laterals combine the two esthetic problems of undersize and incorrectly sharp teeth and are ideal for porcelain laminates. Treatment options include laminate veneers, composite veneering and full crowns . Counihan recommended two basic approaches for the treatment of peg lateral incisors. First is the extraction of lateral incisor and closure of the resultant space. But this may result in a narrow unaesthetic smile. The second possible option is to open the space mesial and distal to the peg-lateral and create a proper space for a normal-sized lateral incisor. The cosmetic dentist has to build up the peg-lateral . A multidisciplinary approach with the inclusion of orthodontic, endodontic, periodontal, surgical and restorative treatment modalities is a must to achieve an adequate occlusion of teeth, a proper gingival architecture and an esthetic restoration for a patient. At the same time these kind of interdisciplinary approach require long multiple appointments . Esthetic tooth positioning starts with the positioning of maxillary central incisor in relation to the upper lip to achieve adequate incisal edge display. If this is inadequate, an interdisciplinary treatment is required which focuses primarily on lengthening of incisal edges with the help of restorative techniques, orthodontic extrusion or orthognathic surgical correction. Next aspect is the maxillary midline correction which can be accomplished by orthodontic or restorative therapy. Evaluation of labiolingual inclination of maxillary anterior teeth is the next aspect in esthetic tooth positioning in which correction of retroclined or proclined teeth may require either orthodontics or extensive restorative therapy and possibly endodontics that can establish a more ideal labiolingual inclination. Evaluation of maxillary posterior occlusal plane should be done in relation to the maxillary incisal edge and its correction requires orthognathic surgery, restorative dentistry or both. After positioning maxillary central incisal edges, incisal edges of maxillary lateral incisors, canines and buccal cusps of maxillary premolars and molars need to be established and this is determined by their esthetic relationship to the lower lip when the patient smiles. Establishing gingival levels is the next aspect in determining the esthetic relationship of the maxillary anterior teeth. Apical movement of gingival margins should be considered if the existing gingival levels produce a tooth that is too short relative to the projected incisal edge position. This can be done with gingival or osseous surgery, through orthodontic intrusion, or with orthodontic intrusion and restoration. Choice of restoration is an important aspect which includes composite bonding, porcelain veneers, bonded all-ceramic crowns, luted allceramic crowns, or metal ceramic crowns . Our choice of interest is to use the minimally invasive porcelain veneers. The case must be carefully selected and treatment planned. The use of wax mock-ups, aesthetic pre-evaluative temporaries (APT), and silicone index help us to get the best aesthetic, phonetic, and functional outcome and also allows for better communication with the patient and laboratory. The interim permanent diagnostic provisional who are worn for a short period of time while the restorations are being fabricated, will further aid to this solid communication and to have an evaluation by patient themselves and also by their family and friends . Shade selection being a vital part of our treatment protocol should be done at the beginning of appointment before tooth preparation using shade tabs, reference photography and technology-based systems . 3-dimensional (3D) intraoral scanning apart from 2D digital photography is currently being used for designing esthetic treatment. It can also be used to make digital impression of the prepared teeth, thereby processing the restorations in a computer-aided design and computer aided manufacturing (CAD-CAM) system, hence opening the path to a new era of complete digital workflow . The need for an esthetically pleasing minimally invasive therapy for the correction of malformed and discoloured teeth is unavoidable as this type of dental disturbance can introduce a grave psychologic effect on the patient. With the use of laminate veneers like porcelain and ceramic veneers, an esthetic and functional restoration can be produced that will give the cosmetic dentist and the patient consistently acceptable clinical results. From the cases discussed, it’s understood that case selection being the most important factor and the patient should maintain the proper recall visits for ensuring the longevity of veneers. The greatest advantage of this technique is it gives maximum esthetic effects and requires minimum or no tooth preparation. So enlighten the smile by beautifying your teeth and let the world smile back to you. Calamia JR and Calamia CS. Porcelain laminate veneers: Reasons for 25 years of success. Dent Clin NAM. 2007;51:399-417. Peumans B, et al. Porcelain veneers: a review of the literature. J Dent. 2000;28:163-177. Strassler HE. Minimally invasive porcelain veneers: indications for a conservative esthetic dentistry treatment modality. Gen Dent. 2007;55:686-694. Belser UC, et al. Ceramic laminate veneers: continuous evolution of indications. J Esthet Dent. 1997;9:197-207. Martos J, et al. Aesthetic approach for anterior teeth with enamel hypoplasia. ContempClin Det. 2012;3:82-85. Oesterle LJ and Shellhart WE. Maxillary midline diastemas: A look at the causes. JADA. 1999;130:85-94. Dlugokinski MD, et al. Restorative treatment of Diastema. In: RE Goldstein, VB Hoywood (eds. ), Esthetic in Dentistry. 2nd ed. BC DeckerInc, London; 2002:703-732. Rammelsberg P, et al. Clinical performance of metal free polymer crowns after 3 years in service. J Dentistry. 2005;33:517-523. Walls AW, et al. 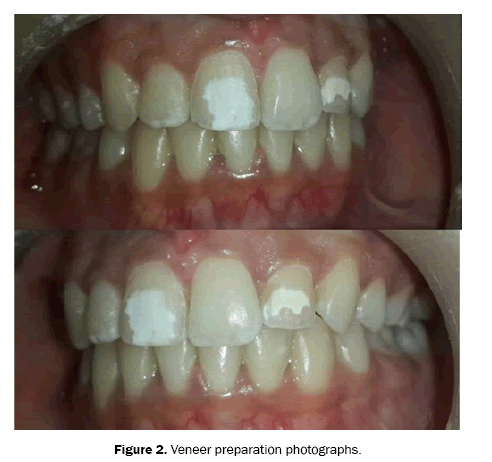 Composite laminate veneers: A clinical study. J Oral Rehabil. 1988;15:439-454. Counihan D. The orthodontic restorative management of the peg lateral. Dental Update. 2000;27: 250-256. Richard D, et al. The interplay of orthodontics, periodontics, and restorative dentistry to achieve aesthetic and functional success. Dent Clin N Am.2015;59:689-702. Frank M,et al. A multidisciplinary approach to esthetic dentistry. Dent Clin N Am. 2007;51:487-506. Gurel G. Porcelain laminate veneers: Minimal tooth preparation by design. Dent Clin N Am. 2007;51: 419-432. Stephen J. Clinical steps to predictable color management in aesthetic restorative dentistry. Dent Clin N Am.2007;51:473-485. Coachman C and Calamita M. Digital smile design: a tool for treatment planning and communication in esthetic dentistry. Quintessence Dent Technol. 2012;35:103-111.